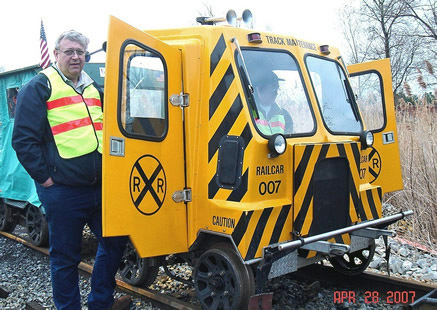 We bought Rail Car 007 in the fall of 2006, at the end of the speeder excursion season. We had a long winter's wait until we could take it on our first run on the weekend of 28-29 April of 2007. During that time, we took our certification tests and arranged for insurance. 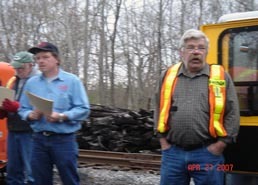 We also made contact with two local chapters of NARCOA: Ohio Valley Railcars and Northeast Railcar Association. We also had the trailer refurbished, stripping it down to the bare metal and repainting, and adding all new tires and wiring. Time for the first run finally came and we headed out to Geneva, New York not knowing exactly what to expect. Despite some correspondence with the excursion coordinator, Warren Riccitelli, as new comers to the hobby we had some apprehension about whether our car would pass inspection or that we would actually be able to be mentored or even get on the tracks. All of those concerns were misplaced, of course. Warren made us welcome and all in the group were very helpful and understanding of two 'new guys' to the hobby. We made some new friends quickly. Bob Hastings was the other 'new guy' getting mentored with us. We met him first as we were both a little lost looking for the set on point. With Bob's help, we finally found it. Bob also kindly provided the pictures on this page. At the set on, we met Jim Gallagher, we had lots of good advice and ideas. Behind us on day one of our first run were Ted and Rita Poesse of Ohio. Ted and Rita were especially gracious to us. Ted's coaching and Rita's suggestions helped us get acclimated quickly. Saturday we began the run at Himrod Junction. From there, we went north to Penn Yan in a light rain. We turned around in downtown Penn Yan. We then went back south along Lake Seneca to Watkins Glen. This was a beautiful ride that included several high bridges and and waterfalls. We had lunch at Watkins Glen and then returned to Himrod. To save time, we all went to the Finger Lakes Geneva yards and set on for the next day's run. 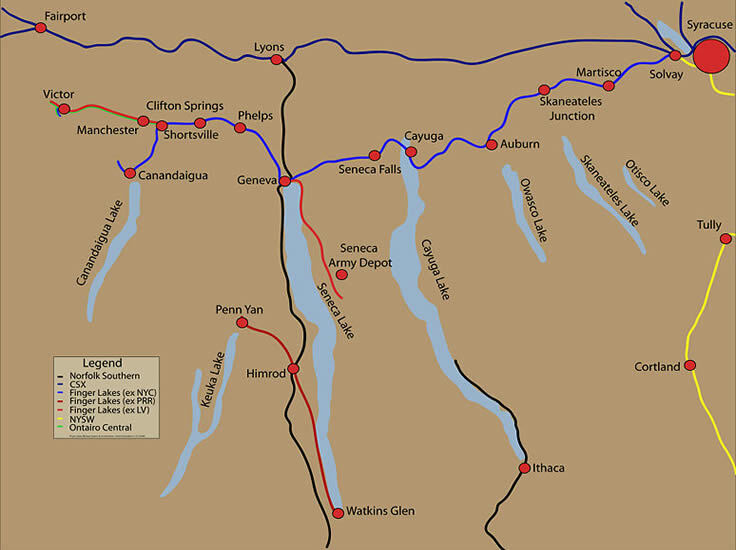 On Sunday, we left the Geneva yards and made the long run over to Canandaigua. It was a sunny spring day and the run went smoothly. The crew of 007 was very happy with the first run of the speeder. It ran well and we learned a lot over the 102 miles of the excursion. We were especially grateful for the welcome we received from the group and the mentoring that Warren provided us. We are looking forward to our next run with 007!